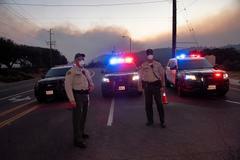 Advisory: LASD Los Angeles County evacuation orders HAS NOT been lifted. Although evacuation orders have been lifted for certain areas in Ventura County, Los Angeles County officials are warning residents affected by the Woolsey wildfire not to return to their homes. The evacuation zones have not been rendered clear or safe by first responders. We understand other counties may be planning to re-populate, Los Angeles County officials have not lifted evacuation orders for Los Angeles County.